To move up the launch of the Note 7 by 10 days and steal more of Apple's thunder, Samsung executives pushed suppliers into meeting faster deadlines despite the phone's significant feature advancements, sources informed Bloomberg. One supplier commented that Samsung was unusually difficult to work with this time, as the company would repeatedly change its mind about specifications and work flow. One of the upgrades in the Note 7 is a 3,500 milliamp-hour battery, up from the previous Note's 3,000. Until recently the main battery supplier was Samsung SDI, a company 20 percent owned by Samsung Electronics which also makes batteries for clients like Apple, one source said. Once the fires began, Samsung Mobile blamed SDI, which initially went on the defensive and suggested that the problem could lay elsewhere, whether in the phone's design or in insulation. Officially Samsung Mobile has since claimed responsibility for the situation. The decision to do a full recall is said to have been instigated by a Samsung engineer asking for one on an internal BBS post, which quickly gained support. 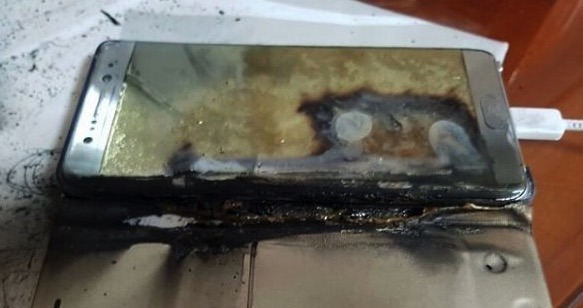 In reports to the governments of Korea, China, and the U.S., Samsung has indicated that a production error resulted in pressure on plates within the batteries, bringing positive and negative poles into contact —in turn generating excess heat. U.S. regulators have specifically suggested that the battery was too big for its compartment. New Note 7 models will have a battery from Amperex Technology, a subsidiary of Japan's TDK. The iPhone 7 is generally considered an evolutionary advancement like the iPhone 6s, above all featuring a better processor, water resistance, and new camera technology, including a dual-lens camera on the 7 Plus. Apple is thought to be saving a major redesign for next year's model, which could have an edge-to-edge OLED display with an embedded "virtual button."